Featuring 36 holes of championship golf -- Newport Bay Course and Seaside Course. 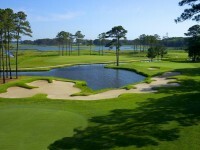 Ocean City Golf Club features our totally re-designed and re-built Newport Bay Course. All 18 holes feature marsh and bay vistas and it is already recognized as one of the most beautiful and finest courses in the Mid-Atlantic. Complemented by our Seaside Course, one of the classic layouts on the Eastern Shore, Ocean City Golf Club offers golfers the resort area's best in traditional and contemporary courses. Come back and play us for the very first time!